The world's biggest statue is rising in a corner of India to honor an independence hero, but it could quickly be outdone by a monument to a Hindu warrior king in the sea off Mumbai. In a burst of nationalist fervor, fortunes are being spent on the effigies, each more than twice as tall as the Statue of Liberty. 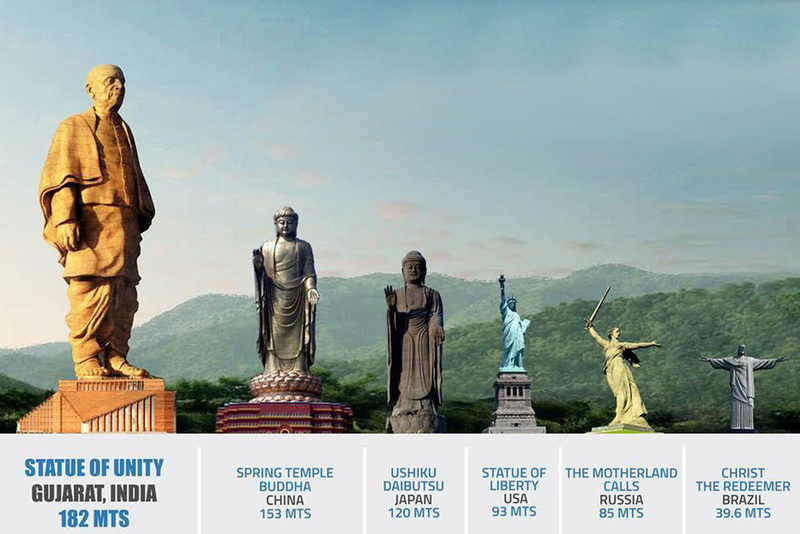 A 182-meter-high tribute to independence icon Sardar Vallabhbhai Patel in Gujarat state will be the first to dwarf the Spring Temple Buddha in China, currently the world's tallest statue at 128m. Pickaxes are also swinging for a 212m likeness of 17th-century king Chhatrapati Shivaji, resplendent on a horse and brandishing a sword. That will dominate the Mumbai shoreline from 2021. Some 2,500 workers - including several hundred Chinese - are now putting 5,000 squares of bronze cladding on the Patel figure for an inauguration on October 31 by Prime Minister Narendra Modi. The 29.9-billion-rupee (HK$3.26 billion) Statue of Unity overlooking the Sardar Sarovar reservoir is a pet project of his. Visitors will be able to access a viewing gallery 153m up on the figure, but they will have to travel 250 kilometers from the state's main city, Allahabad, to get there. There is also a political motive to the project, with India facing a campaign for a national election early next year. Patel was deputy to the first prime minister, Jawaharlal Nehru, after independence in 1947, and Modi's nationalist Bharatiya Janata Party says his name has been unfairly overshadowed by the Nehru dynasty. Patel became the "Iron Man of India" by persuading through talks and hints of force some 550 princely states to become part of India after independence from Britain in 1947. He died three years later. Hindu nationalists feel it was a slight when Patel was asked to step aside to let secular Nehru become the first leader. "Every Indian regrets Patel did not become the first prime minister," Modi said in 2013. "Modi has used Patel's legacy a lot in campaigns," says Ghanshyam Shah, a former professor of class politics at Jawaharlal Nehru University in New Delhi. The opposition Congress party says a plan to change Nehru Memorial Museum into a center devoted to all prime ministers is another bid to taint Nehru's name. In 2016, Modi also laid the foundation stone in Maharashtra for the statue of Shivaji, a hero of the state's 80-million-strong Marathi community. Hindu nationalists have also adopted Shivaji, who made his name battling the Mughal empire. Critics say the 36-billion-rupee statue is a way of winning Marathi votes. And maharaj - or king - is being added to the title of Mumbai's Chhatrapati Shivaji International Airport. "The BJP has been appropriating icons for some time," says researcher Sudha Pai. "Patel has been used to wipe out the Nehru legacy." Preliminary work has started on the project, with a museum, park and helipad on reclaimed land two kilometers out to sea, though environmentalists and fisheries workers oppose it.